Some Voynich ideas | All comments are moderated. Only those on-topic from people who have carefully read what I wrote may possibly be allowed. A very insteresting manuscript held at Museum d’histoire naturelle in Paris has very recently been digitized : Ms 326, a 1487 Italian herbal. on f32r two dragons are touching the leaves of a plant called Erba Gengiana ; dragons are known in a few other herbals but are still a rare sight, so one is inevitably lead to think about the dragonlet on VM f25v . Here, the plants themselves do not look too dissimilar, with long large leaves having lines on them, so that it might thus be tempting to try and determine what could be the name of the plant in that piece of Voynichese. Ms 326 in fact also has two dragons on f50r, but clearly a very different plant than on VM f25v. on f33r several heads in the roots, reminiscent of VM 33r but the plants are not very similar (the fact these are on the same page number is just a coincidence most probably) ; other folios also have heads in roots. There are also noticeable aspects that one finds only in Ms 326, for instance its f42v and f43r depict full humans in the roots of two plants. And many of the VM plants are unmatched. So, overall, this is another Italian herbal with some definite similarities but also dissimilarities with the VM, and one possible clue with Gengiana. Now in this 1820 dictionnary, that word is the italian for gentian or felwort (french: gentiane), and indeed in a 1505 italian translation of an older medical text by Guy de Chauliac, the word gengiana is used in a recipe for head issues (in the same paragraph there’s mention of “sangue de drago” which, according to a french version of that book, is the name that physicians used for sap, or perhaps cell sap, for certain plants), as well as in other types of health matters. And this is precisely the use that the italian herbal mentions : suco. Felwort does have star-like petals with lines on them, but they are purple while in the VM probably green leaves are depicted. Does the dragon then simply mean that sap (or cell sap) is the interesting part of the plant ? An alternative to this suco idea : according to this french blog, yellow gentian can be taken for false helleborine (veratrum album) which is highly poisonous. And the leaves of that plant are indeed close to the VM f25r. So that might also be the significance of the dragon (lethal product). At this stage I prefer the suco one, which is plainly there in the italian herbal. Comparing this to the known examples of Sagittarius-with-crossbow identified by Zandbergen and by Worley, or by Petersen (first article, second article) it seems to be among the closest matches. Now, this manuscript is a chronicle written in Lucerne in 1513, so not too far from Constance and about 55 years later. 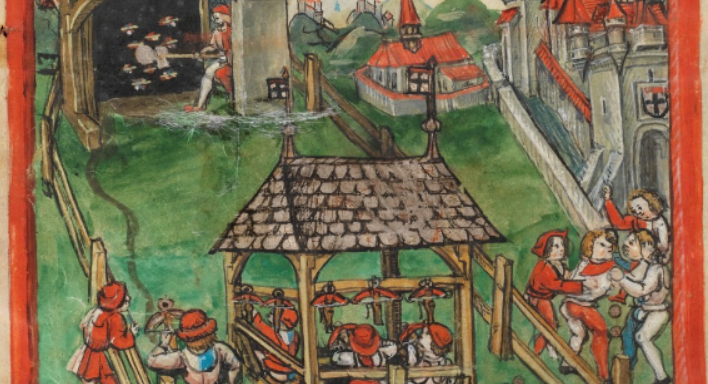 It is not clear whether it depicts crossbows of 1458 Constance or 1513 Lucerne. But, given my previous article on a vellum type from Lucerne, it is yet another clue in favor of that part of Switzerland, and adds a little bit more to the background for the current searches over at Pelling’s blog. On the other hand, the type of clothing doesn’t match that the VM : it is unclear whether this due to a simple change of fashion over a few decades, or something more critical. Until recently, as mentioned here, I had not found a manuscript with vellum repairs comparable to those of the VM, and had only found sort of a similar repair on the last folio of a XIIth century manuscript. So while I’m not going to conclude that the VM has exactly the same origin, it is reassuring to finally find a good match in terms of appearance and era (which makes it a prime target for any DNA comparison). Lucerne is located in the German-speaking part of Switzerland, so this is consistent with the german words in the marginalia on f116v (and a similar-looking marginalia produced in St-Gallen mentioned a while ago). It is not too far from the lake Constance area were good matches in terms of clothing, of Saggitarius-with-crossbow, of castles with swallowtail merlons, have been found. As for the later additions on the VM, recall also that the nice VM-looking primus I had identified earlier comes from a nearby region, and that some french-speaking Swiss person could easily have come from the area and written the months names later on. So overall I am definitely leaning towards this area of Switzerland to south Germany. In all probability, the months names in the zodiac section of the VM (discussed previously on this blog) have been added after the drawings were made. So about 1405 onwards. When exactly, and in which context, is open for investigations. octembre: can be found in several places, including France (Metz in 1417 ; Boulogne-sur-Mer in 1415 ; Vannes (formely Vennes) in 1386 ; Paris in 1372 at a stretch) Belgium (Soleilmont abbay at least from 1443 to 1497) Netherlands (Duchy of Brabant in 1334 at a big stretch). There must be Swiss examples that I’ve missed too. So nothing very specific, but generally no later than 1500, which does match the VM handwriting nicely. augst: can be found in (too) many places and eras. From more recent to older there is: France (in a 1564 baptism registry of Saint Erblon in Brittany), Germany (e.g. in the book Chronik aus den hinterlassenen Handschriften: von 1500 bis 1580), Italy (in Milan in this 1521 letter) England (the royal example from London in 1404 that I had found). So clearly this word alone cannot be used as a marker of any kind. Overall, still no clear-cut place nor era then, but it does rule out southern parts of France for instance. Here are some illustrations that I’ve stumbled upon recently which deserve mention. and here is the link to it. So overall, this master and the VM author do share similar influences, but those are probably not specific enough to go much further. 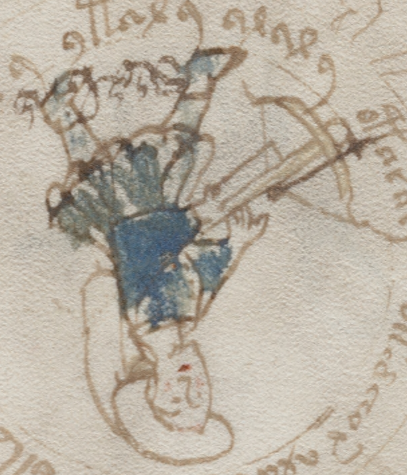 Another illustration that is a little reminiscent of the VM is f40 of MSS Pal.Lat. 1726, but since it is under copyright I can only provide the link here. It depicts a VM-style naked lady with a crown in a small pond with fishes and birds, and corresponds to the month of March in that manuscript. It is in fact Venus (as mentioned here) and the manuscript is Fulgentius megaforalis. Again, I’m not claiming this is the same author as that of the VM, other illustrations nearby make that clear (a very dissimilar sun in particular), but it does have similarities in that the VM also has two fishes for march on f70v and they seem to be of the same species (shape, number of fins, type of head). For some time I couldn’t find manuscripts that had the same type of repair, either the sewing thread was still there hiding it, or it had been too closely sewn and just looked different. But the bottom right corner of the final folio f68v of Pal. Lat. 1158 here does have some similarities. 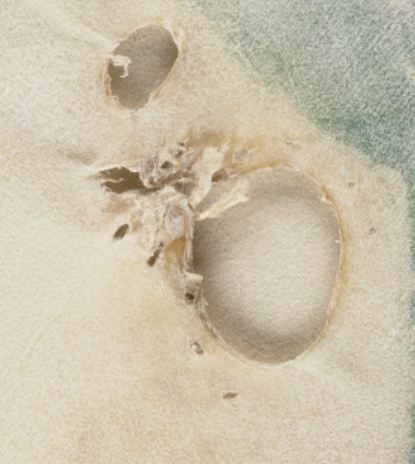 Also, the shape and thickness of the bottom of that manuscript’s f66v is typical VM style vellum, I would think. Alas, according to this, we’re looking at a XIIth century vellum here! So that type of sewing repair, and of folio cutting, isn’t specific at all to the VM nor its era since it existed centuries earlier. 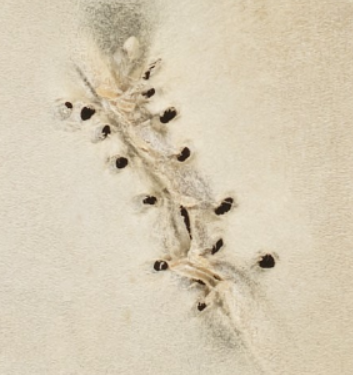 On the other hand, since most XVth century manuscripts have much better-looking repairs, it might be that the VM vellum is of a fairly artisanal origin. Hopefully some DNA testing will be done on the VM in the nearby future, and compared to other sources. Some genetic variants may well help pinpoint a specific type of cattle, or at least a not too rough geographical origin. Since the well-known marginalia of f116v seems to have some German aspect to it (line 1 and 4, that is), I have started to look for instances in German manuscripts of handwriting, and hopefully even bits of sentences, that look as similar as possible. One large source of digitized German manuscripts is the Universitätsbibliothek Heidelberg, in particular its Codices Palatini Germanici holding, a set of 848 manuscripts, a good half of which were written between 1350 and 1510. I am in the process of reviewing each such manuscripts, and far from done yet. Here I’d like to report on something a little similar to aspects of the script that appears on f116v of the VM. I’m referering to Cod. Pal. Germ. 329, a text written in 1415/1415 by Austrian ministrel Hugo von Montfort (1357-1423). The book itself is written in a nice and regular gothic script, with many beautiful decorated initials. There are two things to note here. First, the word ‘clugen’ has its ‘cl’ which looks quite close to one of the VM gallows. That’s only the second time, outside the VM, that I’ve found a similar shape that is true text and not a decoration, the other instance being the ‘-tem’ part of the latin word ‘item’, and so it is the first example where it can occur at the beginning of a word, like in the VM. Secondly, the letter ‘r’ (clearly seen in the words ‘werburg’, ‘worten’ and ‘graff’) does appear quite similar to those appearing on f116v of the VM: a vertical bar, sometimes with a hint of upward-right motion at its base, followed by a dot. But the rest of the script is markedly different (letters ‘m’, ‘a’…). So, while I’d conclude that this is certainly not the author of the VM marginalia, the occurence on a provably 1415 german text of both that quite rare shape for ‘r’ together with a gallow-looking symbol (which turns out to be standard alphabet) makes me want to find more examples both of Hugo von Monfort’s casual handwriting, and more generally of that of his contemporaries, to see whether they, too, wrote ‘cl’ like that. The amount of information that the VM’s quire numbers (discussed previously on this blog and elsewhere) actually contain is yet unclear, so it is desirable to try and narrow things down as much as possible. Nick Pelling has recently mentionned another manuscript, Cod. Sang. 688, where within the main text a ‘quartus’ abbreviation matches that of the VM, but the other abbreviations do not match. Here, I’d like to mention some different manuscripts which happen to contain very similar abbreviations than those of the VM. They are currently held by the Universitätsbibliothek of Graz, Austria, but they have varied provenances. Regarding quire numbers, there are two manuscripts standing out. The first one is MS384 (catalog record). It is a 12th century manuscript, with 12th century roman quire numbers, but that has been annotated at the top of each folio with the book and chapter numbers corresponding to the text. These annotations were made in the 15th century, but unfortunately no precise date (I infer this both from the handwriting and the fact that tha catalog says a typical leather cover with stamps was added to the manuscript in that century). Now, Ms384 comes from the Benedictine Seckau abbey (Chorherrenstift Seckau — here is the translated more informative german wikipedia article), which is in the middle of Austria, some 400km east of Lake Constance. It has been kept there for centuries, and was acquired by the Universitätsbibliothek of Graz around 1830 (a part of the manuscripts from the abbey went there, the other part to the city archives Steiermärkische Landesarchiv — probably both are good places to do further research then). So what we notice is an extra ‘t’ in ‘quartus’ compared to the VM. Otherwise that’s pretty much it. And yet, note that in Ms384 the word ‘decimus’ is never abbreviated with an ‘9’ for ‘us’, but simply as ’10’. Similarly, ‘undecimus’ is abbreviated by ’11’. But if you thought that this is still a unique case of close similarity, then read on. The same library contains also several manuscripts from the Carthusian monastery of Žiče (middle of Slovenia, about 150km south of Seckau, and about the same latitute as northen Italy). Back in the middle-ages, it had a renowned pharmacy and also a very rich and famous library of 2000 manuscripts (sadly, only about 200 survive today, including fragments ; they were given to the library of Graz in mid-16th century). Here are the actual folio numbers if you want to check for yourself: primus on f18v, secundus on f19r and f30v, tertius on f42v, quartus on f54v, quintus on f66v, sextus on f78v, then several are missing, then decimus on f126v, quartadecimus on f180v and quintadecimus on f196v. So, while some of the tricky ones are missing (septimus, octavus, nonus), those that are there are exact matches, except primus. But note that in the margin of f73r there’s a septima in red ink abbreviated as in the VM, and similarly there’s a nice ‘pm9’ on f142v. Therefore, it could easily have been even closer. I’ve looked at the other manuscripts from Žiče held at Graz, to get some more information. Now, Ms1474 is dating from 1423, and that date is written in similar numerals on f195v. But there’s an extra page inserted in this Ms, f175r/f175v, which dates from 1416 and where the date is written with roman numerals. I infer that the transition to such numeral in Žiče happened around 1420. At the other extreme, Ms262 is dating from 1468, and this type of numerals was clearly still in use then (e.g. see f319r and 320r which contain chapter numbers 14 and 15 in that style). In fact Ms910 dating from 1501 still does (see date on f1r, and chapter number 4 on f85r), while Ms988 from 1511 finally uses the new type of 5 (see f1r). So there’s at least a span of 80 years, as far as Žiče is concerned, where that type of abbreviation was probably in use. I am not at all implying that the VM travelled, or originated, to or from either Seckau or Žiče, of course. On the contrary, all this is showing is that this type of handwriting and abbreviations was quite widespread geographically and temporally. So quire numbers alone are probably not able to provide an extremely precise location nor dating. To conclude, of course the clues coming from the VM illustrations themselves (for instance the zodiac ones pointing to the area of Lake Constance) are more fundamental. The discussion above doesn’t rule out that hypothesis, it’s just that I haven’t looked at many Bavarian manuscripts yet..